Controlling money, always criticising and being purposely isolated from friends and family are just some of the signs being highlighted as ‘coercive control’ in a new campaign on Domestic Abuse. The ‘Escape the Control’ campaign, launched across Sefton and Knowsley, is a joint initiative between the two Local Authorities to help people understand how extreme controlling behaviour is Domestic Abuse and what signs to look out for. Coercive control is an act, or a pattern of acts such as threats, humiliation and intimidation that is used to punish or frighten the victim. This can include things like controlling where they go and what they do, or exaggerated expressions of love such as they ‘can’t live without you’. years in prison and/or a fine. Posters and leaflets explaining the signs to look out for will be available from next week in GP and Health Centres, Leisure Centres, Dentists, Hairdressers and many more everyday locations where victims and those worried about others can access them without having to go through official channels. 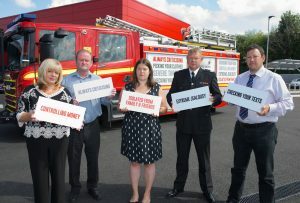 ‘Escape the Control’ will also be featured across buses, taxis and fire engines in Sefton directing people to more information on the Escape the Control website. Cllr Trish Hardy, Sefton Council’s Cabinet Member for Communities and Housing, said: “The number of people accessing domestic abuse support services continues to increase, with the number of high-risk clients being supported increasing by 63% between 2013/14 and 2014/15. individuals can help themselves or others. “Everyone has the right to live free of fear. If you are unreasonably under suspicion from your partner or a member of your family to the point where you are unable to remain in contact with your circle of friends; if you are constantly questioned about who you were talking to or who you were texting; perhaps you have no access to money, even the money you earn. More information about the Escape the Control Campaign, including stories from people who have lived through it, is available at: www.escapethecontrol.co.uk.